Are there any fans out there of the cult 1980s movie Highlander? Well, you are in for a treat because Microgaming released a video slot inspired by the sword-wielding hero Connor MacLeod and his action adventures. Just like the movie, the Highlander slot game is also set in in the Scottish Highlands and New York City. It features magnificent graphics as well as authentic footage from the film. A touch of nostalgia but also a powerful set of features are the two most notable characteristics of the Highlander video slot. Microgaming stands behind it, so you already know it’s going to be a good one. 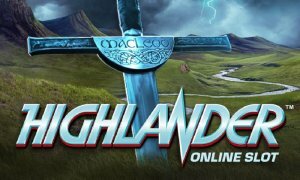 The return of Connor MacLeod of the clan MacLeod in Microgaming’s Highlander slot is just as epic as you might expect. The background shows dark green, misty hills of Scotland with a stormy sky above. As lightning plays a major role in the legend of the immortal swordsman it had to have an appearance in the game as well, obviously. The reels are framed and the game’s logo dwells above, and we can say the game boasts a clean design which is rich in details at the same time. There are two groups of symbols, one of playing card icons standing in for lower values and another of characters from the movie, namely Connor Macleod (two of them, one modern and one old), Brenda Wyatt, Heather MacLeod and The Kurgan. The slot is played across a classic 5×3 reel set with 243 ways to win, so there are no typical paying lines involved. Any group of symbols on adjacent reels wins. You can count on two special symbols, a Wild represented by MacLeod’s sword and a Scatter represented by the MacLeod clan symbol. Movie fans will be satisfied with the choice of visuals, we reckon. As you spin the reels and immerse yourself in time travel, sword fighting and overall the epic atmosphere of the game, you’ll find your way to the special features as well. The main feature in Highlander is the Free Spins round. You’ll trigger it by landing three or more Scatter MacLeod clan symbols anywhere on the reels. The prize is 10 free spins. During free spins, another feature will be active, called Quickening Wilds. These special Wilds will appear randomly after lightning strikes, and the more of them occur the more Wilds will help you complete winning combinations. The Highlander Slot also features a Two Scatter Win feature which pays you out for only two Scatter on screen. They will turn Wild and make unexpected winning combos. One other great thing about Highlander is the higher-than-usual RTP of 97.00%, which rounds up the appeal of the game even if you aren’t much of an admirer of the Christopher Lambert-starring flick. It’s an affordable online slot machine that will bring you back to older times and supply you with some impressive earnings in the process. You may not gain immortality by playing Highlander, but you’ll get the best of Microgaming-powered slot entertainment, for sure.